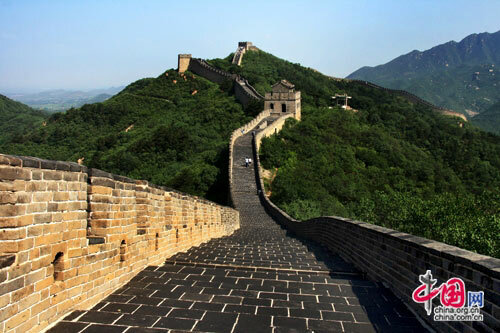 Built in 1505 during the Ming Dynasty, Badaling (万里长城－八达岭) is one of the most important sections of the Great Wall. Located in Yanqing County, 70 km from Beijing's city proper, Badaling is also the most frequented section of the Great Wall by visitors since the Ming Dynasty. Constructed of large blocks of granite and bricks, the wall at this section is 6.6 meters high and 6.5 meters wide at its base, narrowing to 5.5 meters on the rampart. It is wide enough for five or six horses to stand abreast. In recent years, the government has carried out restoration work on the sections of the wall which have collapsed or been eroded by wind and sand. Despite this, the rapid increases of tourists visiting this section of the Great Wall in recent years have led experts to suggest the opening of a "second Badaling" to accommodate them. Take bus No. 880 from Deshengmen Bus Station; or drive along the Badaling Expressway via Madian Overpass.